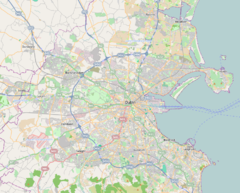 The Islamic Cultural Centre of Ireland (ICCI; Irish: Ionad Cultúrtha Ioslamach na hÉireann) is an Islamic complex, including a mosque, in Clonskeagh, Dublin, Ireland. It is funded by the al-Maktoum Foundation of Dubai and has a Sunni orientation. In 1992 Sheikh Hamdan bin Rashid Al Maktoum, Deputy Governor of Dubai and Minister of Finance and Industry in the United Arab Emirates, agreed to finance a piece of land including a building to house a school and later on agreed to sponsor the construction of an Islamic Centre on the same site. At the time, 4,000 Muslims lived in Ireland. Construction of the ICCI began in 1994 and it was officially opened on November 16th 1996 by President Mary Robinson and Sheikh Hamdan Al Maktoum. It is located next to University College Dublin. The mosque and cultural centre include a main prayer hall, a restaurant, a library, meeting rooms, laundry facilities, ten apartments, administrative offices and recently a shop. A primary school is also located on the premises. The ICCI was designed by the Irish architect firm, Michael Collins & Associates. The layout is based on a square divided into nine smaller squares, with the mosque placed in the centre. The building is a steel frame structure with brick infill and is detailed with stainless steel. Executive director of the ICCI is Nooh Al Kaddo, an Iraqi native who moved from Liverpool to Dublin in 1997 to run the Islamic centre. The imam of the ICCI is Hussein Halawa, who came to Ireland from Egypt in 1996 and is also chairman of the Irish Council of Imams. The ICCI supports Yusuf al-Qaradawi, the antisemitic founder of the European Council for Fatwa and Research (ECFR) and ICCI also hosts the headquarters of ECFR. The ICCI hosts the Muslim National School, a state funded primary school, with an Islamic ethos and with over 260 pupils. The religious department is sponsored by the al-Maktoum Foundation. The centre housed the headquarters of the International Association of Muslim Scholars (later International Union of Muslim Scholars) before it moved to Qatar. Also the ICCI hosts the European College for Islamic Studies which holds correspondent courses for another Federation of Islamic Organizations in Europe (FIOE) central institution, the European Institute for Human Sciences. Analysts state that FIOE is an umbrella for Muslim Brotherhood organisations in Europe. ^ "'Fatwa' sheikh with links to Irish Muslims is refused visa - Independent.ie". Independent.ie. Retrieved 2017-06-06. ^ Vidino, Lorenzo (2010-09-22). The New Muslim Brotherhood in the West. Columbia University Press. ISBN 9780231151269. ^ "Political Islam in Ireland and the Role of Muslim Brotherhood Networks - Edinburgh Scholarship". doi:10.3366/edinburgh/9780748696888.001.0001/upso-9780748696888-chapter-5. ^ "Religious groups back removal of blasphemy from the Constitution". Irish Independent, 23 October 2018. ^ "Blasphemy, Stephen Fry and referendum in Ireland". BBC News, 20 October 2018. This page was last edited on 26 October 2018, at 20:12 (UTC).